Note: A new version of this software suite, called simply 'ChemOffice Professional 17', is available on the software site. Use the instructions below only if you have a specific need for an older version. Studies of Chemistry and Biology require searching for information using chemical structures, as well as drawing and presenting them in electronic and print media. The important thing to remember here is that the software is not licensed for commercial use. 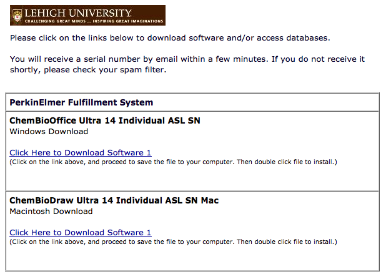 Lehigh’s license for ChemBioOffice with CambridgeSoft provides for its installation on personal machines (for students and faculty working at home), but the procedure is a little more involved, since it requires registration with PerkinElmer (CambridgeSoft’s parent company) and obtaining and installing one’s own license key for the software. Since the Mac version of the software uses a different licensing system than the Windows version, this same method must be used, whether they’re Lehigh machines or personal ones. 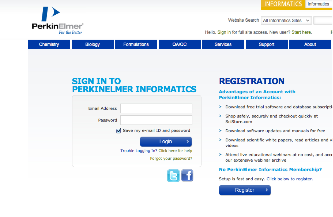 Basically, users need to register with the software’s developer (PerkinElmer Informatics), download the software from their website, and activate it with their own unique serial number, which Perkin Elmer will send via email. This needs to be done annually, but the vendor does send out reminders to individual users, and the installation can be done anytime. If you’ve never done so, register with PerkinElmer Informatics using your Lehigh email address. 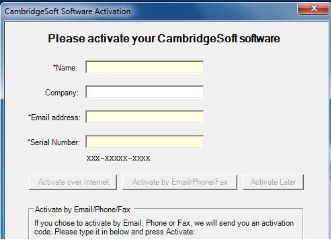 Go to: http://www.cambridgesoft.com. On that page, click on the ‘Register’ link, fill in your info, and follow the prompts. If you’re already registered, log in, by clicking on ‘Login’, and then click on ‘My Account’. If you’re already logged in, just go to step 2. Important: The license you will receive is keyed to your email address, and must be in the “lehigh.edu” domain, so be sure to register with your Lehigh email address. Once Logged into PerkinElmer, navigate to the “Site Licensing” area. Check your Email, and Save your License Information. 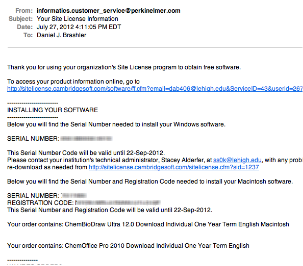 PerkinElmer Informatics will send a license key to the email address with which you registered. This is your personal code. Don’t share or lose it. Note that codes for both Mac and Windows versions are included. It’s wise to save this document somewhere you can find it if you need to re-install the software. 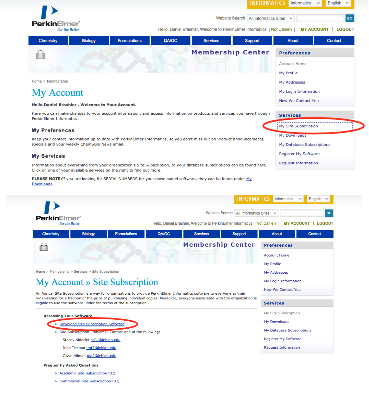 It might be wise to store a hint there regarding your PerkinElmer site password (most will only use it once a year. . .). 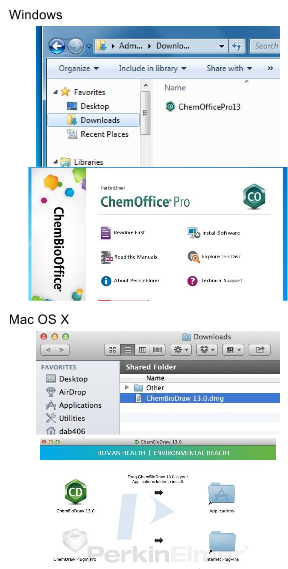 License and activate the software: After the installation, Windows users will find ChemBioDraw in in their Start menu under ‘All Programs’ and Mac users will find it in their Applications folder. Again, double-click to run. When it runs for the first time, Windows may determine that an additional package is needed (.Net Framework). Simply let Windows download and install this package, restart your machine, and run ChemBioOffice again. The first time it starts up, ChemBioOffice (or ChemDraw on the Mac) will present a window requesting activation -- enter your name, email address and serial number as they appeared in the email you received. Then, click on ‘Activate over Internet’. Once activated, the software will finish starting, and take you to a blank document.